The prophecy of the Blackest Night has come to pass--a mysterious force is raising deceased heroes and villains into an army of undead Black Lanterns! The combined might of the Green Lantern Corps and an armada of living superbeings must now band together in a fight quite literally for their lives. The incredible saga from #1 New York Times bestselling writer Geoff Johns is collected here in its entirety for the first time ever in paperback in this new DC Essential Edition! A war has been brewing between the different colored Lantern Corps--the Green fighting the Yellow, the Red trying to destroy all, the Blue attempting to broker peace between the tribes. However, the real battle is yet to come: the undead Black Lanterns are coming and seemingly nothing can stop them. 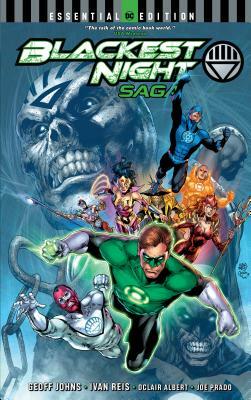 Putting aside old vendettas, it's up to Hal Jordan and the Green Lantern Corps to lead DC's greatest champions as well as their deadliest foes in a battle to save the Universe from an army of the dead.